Home News & Analysis Europe and CIS Serbia Protests Escalate Beyond “Stop the Bloody Shirts” — Is This Time Different? The protests were initially sparked by an attack on opposition politician Borko Stefanović on November 23th in Kruševac. Under the slogan “Stop the bloody shirts”, the protesters called for an end to political violence in Serbia. The aims of the protests immediately broadened to include many other grievances against the current government. 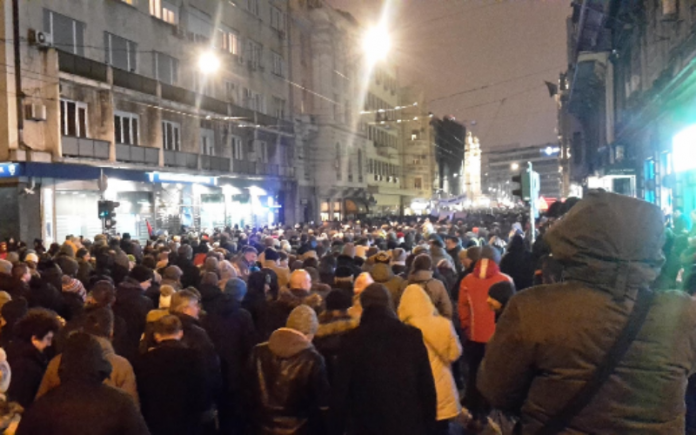 The latest protest, held on January 16th, was timed to mark with the anniversary of the murder of Kosovo Serb politician Oliver Ivanović, a case still unsolved. The organisers of the protests have made several demands including: an investigation into the murder of Oliver Ivanović; the resignation of Interior Minister Nebojša Stefanović; five minutes of coverage of the protesters by the state broadcaster; punishment of those responsible for beating Borko Stevanović; an investigation into the attempted murder of journalist Milan Jovanović, and for Vučić to publicly reveal a plan to resolve the Kosovo issue. Dissatisfaction with the current regime has been rumbling for some time. Previous protests have also bought up the recurring issues of corruption, a lack of press freedom and attacks on journalists and opposition politicians. Most notably, the protests that followed the demolition of private property by masked men to make way for a huge government property development, which took place under the slogan “Let’s Not Drown Belgrade”. They similarly expanded to express broad dissatisfaction with the government before fading in popularity. A political party was formed from the protests to run in the 2018 Belgrade city assembly elections, but it did not pass the threshold to gain a single representative in the city assembly. Vučić’s inauguration as President in 2017, having previously served Prime Minister, was also accompanied by large protests. The current protests have touched more areas outside of the capital city of Belgrade more effectively than previous campaigns. They began in Kruševac, a town in central Serbia, where Borko Stefanović was attacked. Protests have also been held in the largest southern city of Niš, the northern capital of Novi Sad and other towns across Serbia. While previous protests mostly took place in summer, these have been held in winter, often in freezing temperatures. This indicates the motivation and strength of feeling among the protesters. Although they have not reached the size of the protests that toppled Slobodan Milošević in 1990s, comparisons are being made by the protesters and in media. Vučić dismissed the protests as attempts by the opposition to bring down the government. Opposition leaders attended and supported them, but the organizers insist on their independence. Vučić disregarded the effectiveness of protesting, arguing that he will continue to pursue his current policies even if 5 million people are on the street. This comment prompted the protesters to adopt the slogan ‘1 of 5 million’. Pro-government counter-protests have not managed to mobilize comparable numbers of people. However, Vučić used the visit of Russian President Vladimir Putin on January 17 as a counter-protest. Some members of the huge crowd of over 120,000 carried banners reading ‘1 of 300 million’, a retort to the ongoing protests that references a Serbian saying about the strength of Serbia and Russia’s ties. Putin is a strong supporter of the current regime. The huge attendance has been marked by accusations that civil servants and the employees of state-owned companies were pressurized into attending and transported by hundreds of buses at public expense. Given Vučić’s willingness to ignore the protesters’ demands and wait for them to end (as he did with previous campaigns), the next step is crucial. It is far from clear what will be effective. Previous attempts to form new opposition political parties have failed to gain wide support. An alliance with the opposition parties is possible, but many of their leaders did not live up to expectations when in power. Furthermore, they are riven with infighting and rivalries that prevent them from coming together. Such is the dominance of Vučić’s Serbian Progressive Party (SNS) in elections that he may look to break the deadlock with the protesters by calling an early election to demonstrate his strong popular support. He has yet to confirm this idea publicly. The latest anti-government protest in Belgrade was one of the largest, suggesting that there is still support for further protests. As long as they remain once or twice weekly, however, the government will likely continue to ignore them. Previous campaigns suggest that the potential for the protest movement becoming a significant political movement is small. Therefore the protests are likely to continue in the short term. Nevertheless, they will probably fade later in the year unless either the government’s reactions or the strategy of the protesters changes to force the government to take more notice. The increasing prevalence of large protests about a variety of issues, from ecology to airport management in Serbia is indicative of an increasingly authoritarian regime. It demonstrates that some citizens feel protests are the only way to challenge a government that has taken firm control of the media and removed critical voices. In this sense, the protests reflect a long-term threat to Serbia’s movement towards the EU and towards a more democratic society. Luke Bacigalupo is a political analyst currently based in Belgrade, Serbia. He holds degrees in South Eastern European Studies and Modern History from the University of Belgrade and the University of Oxford, respectively.